What goes on behind closed doors is the subject for Dagmar Cyrulla’s most recent body of work, Watched and Watching. Cyrulla has captured an interior, domestic realm that abounds with suburban familiarity. However it is the relationships played out on this private stage that are the true subject of these skilfully rendered oils and works on paper. This hidden terrain is charted through a language of glances and gestures that resonate with emotional and psychological charge. Some pieces such as Getting Ready, feature heavily pregnant women as they distractedly watch the television or get changed. These works in particular appear languid with the atmosphere of an impending event, while others such as Judged and the Visitor contain the trace of what may have just past. The echo of harsh words spoken, or perhaps the tension before they are uttered. In The Couple two people lay next to each other back to back. While they are both curled up and make no physical contact, their bodies express a complete familiarity with each other. A simultaneous distance and closeness that is immediately identifiable. 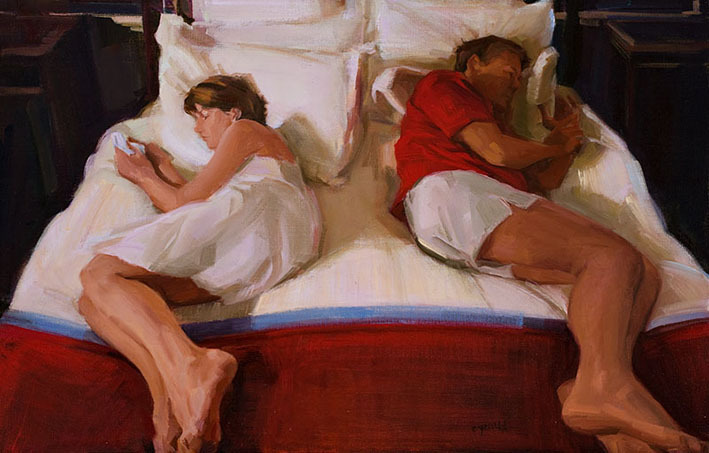 Cleary Cyrulla is comfortable in the domain of the ‘private moment’, and cites Eric Fischl and Edward Hopper as influential in this. Yet there is no sense of intrusion that voyeuristic works of this nature often necessarily contain. But rather we are allowed inside for a glimpse at what lies behind the public facade of Cyrulla’s protagonists, and to guess what thoughts certain actions might betray. Indeed some works like Judged invite us in, through a direct stare which at once confronts and challenges the viewer to reciprocate. 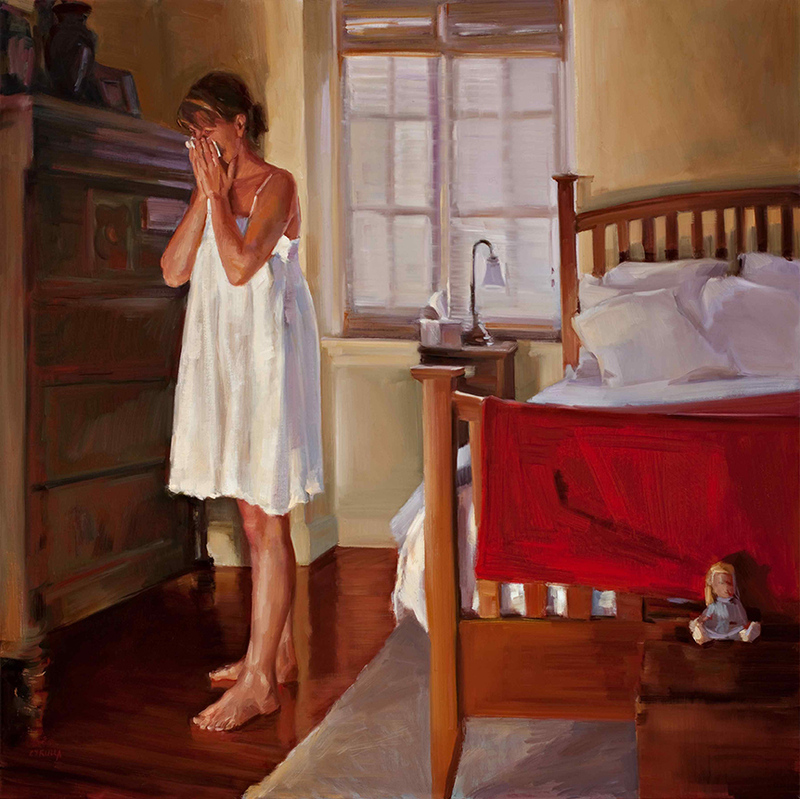 The artist adeptly captures the space within each room, her restless brush giving the pillows, drapery, and the air that surrounds them as much attention as the figures which populate these works. Yet the real strength of these paintings is not in their convincing rendition of space, light and anatomical accuracy, though these things are handled well. It is in their expression of the small stories which take place in every life, every day. They are distinctly un-monumental – and successfully blend gravity and poignancy without any trace of saccharine sentiment. Tags: art, arts, contemporary, dagmar cyrulla, painting, relationships. Bookmark the permalink. Thanks for stopping by my blog. I’ve enjoyed a couple of your entries! Thanks for posting about artists I would otherwise have not have seen! Thanks, I really enjoyed your piece on Dan Flavin and thoughts on drawing.. couldn’t agree more!